Branson is truly a special place, one in which we are thankful that we get to call it home, but it isn’t the only “horse” in town. Sometimes you want to stay and play in a place that is close to all that is special about the big city, but is far enough away to give you a sense of seclusion and privacy. When that is what you’re searching for, Hollister, Missouri—home to Buffalo Ridge Springs Golf Course near Branson—is just the place for you! Visit scenic outlooks, shop in Olivia’s Heartland, or spend every day of your trip on the links at Buffalo Ridge Golf Course near Branson, MO . It doesn’t matter what you do while you’re here, just know that THIS is going to be the vacation you dream about for years after you return home! When you’re this good, there’s no need to brag, but you should probably know that Buffalo Ridge Springs Golf near Branson has been voted the #1 Public Course in all of Missouri by Golf Magazine, and you’ll see why from your first step onto their lushly manicured greens. Designed by Tom Fazio, the natural beauty of the Ozarks landscape shines even brighter here. Acres of velvety emerald grass, tranquil ponds that serve as water hazards and homes to local wildlife, and vast expanses of wooded areas that look as if they should be on the front of a postcard will have even the most jaded of travelers stopping for a quick photo opportunity in the middle of their game, especially when visited by the free-range bison who make their home in Dogwood Canyon Nature Park located right next door! The course is challenging without being intimidating to novice golfers; every player feels at home at Buffalo Ridge Golf Course , no matter what their skill level! Buffalo Ridge Springs Golf Course will be closed April 16–22, 2018 for the annual Legends of Golf Championship, so plan your vacation accordingly. Rustic cabins, modern condos, even ranch homes and farm houses can be found in and around Hollister, and when you rent from Sunset Nightly Rentals, you are assured that your accommodations will be first-class! Warm wood floors, generously sized windows, and stone fireplaces are just some of the luxury amenities you can expect to find in a Hollister vacation rental. 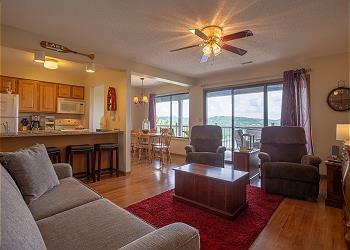 The extensive views of the Ozarks landscape come with no extra charge! THIS is the family vacation spot you’ve always dreamed about. What are you waiting for? Book Your Sunset Nightly Rentals Vacation Home Today! This could be the start of a vacation tradition! Contact our reservation specialists today and start planning your trip to Hollister, MO. We can answer any questions you may have, and even help you find other fun activities and attractions to enjoy while you are here.